Daughter of a municipal executive and a high fashion dressmaker, she made her first television experience in the 1985 as an announcer for the broadcaster Videoregion. At twenty he wins a public competition to join the Forlì ASL where he will work full-time for over ten years. Only after the age of thirty he decides to start his career as a radio and TV presenter and journalist as his primary activity. The occasion that drives her to change profession is particular. In the summer of 2002 Open Studio commissions a friend of his cameraman for a service on the Romagna Riviera. The journalist who has to appear in the service does not show up for the appointment and the cameraman asks Tassinari to replace him. The service goes on air anonymously, the shots of Tassinari are in fact cut during the editing. 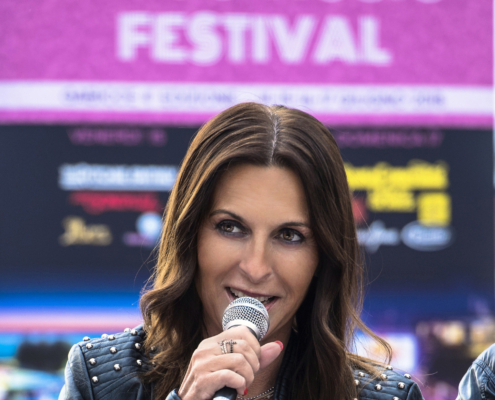 Tassinari's work affects both Studio Aperto's editorial staff and Tele1 director Faenza, Graziano Bassi, who calls her the following year to work with his broadcaster. In the 2003 Tassinari debuts as a television announcer at Tele1. After a few months, she was entrusted with running the entertainment program, again on Tele1 A dream on the Riviera. For the same broadcaster it broadcasts for four consecutive years A kiss in the night. He becomes a journalist in the 2006. In the same year he began to collaborate with RAI 1 first for Italian holiday then as sent to Watch out for spending (will play this role in three editions of the program). From 2010 onwards he collaborates with numerous radio programs of Rai Radio 1. He made his first radio experience as a correspondent of Double Female, program conducted by Jo squillo e Maria Teresa Lamberti. In the 2010 and in the 2011 he is part of the jury for the selection of the new entries of the Festival di Castrocaro of which he also follows the live radio together with his colleague Gianmaurizio Foderaro. Leads with Pupo Watch out for Sanremo, the post Sanremo 2011 radio festival. During the festival he is a regular guest on various Rai television programs: If ... at Paola's house, Live life, Noon in the family e Italy on the 2. Both in the 2011 and the following year he participates in the TV window of RAI Radio 1 of Festival of Sanremo. The same year RAI Radio 1 asked her to draw up the participants' report card a X Factor for 'Extra Factor of Rai 2, leads the radio live of Ciak ... you sing! (simultaneously with the live television broadcast on RAI 1), Small coffee and the competition Bellissimamente, an award given to talented women broadcast on RAI. From 2013 to 2016 is sent to Animal chronicles on Rai 2. In recent years he has intensified his appearances as a television host: Italy on the 2 on Rai 2 e Live life on Rai 1, Wrong or right e Summer live on Rai 1, Italy Yes.